I must admit I never really thought about money in RPGs until I found the CRPG Addict and CRPGs Revisited sites and their rating category “Economy”. To summarize the Addict, a game would get a high “Economy” rating if there were lots of ways to make money and lots of ways to spend it. The first part of that statement is usually not a problem; the games that are really stingy with their money are few and far between. The second part is more tricky, as at some point you’re often winning dragons’ hoards and raiding royal treasuries – what would you do with that kind of money, buy an island or four? Thinking more about it, I realized that up to then, I had taken it for granted that just as I was definitely far more powerful than the general populace at that point – and wanted to feel that way -, I also was bound to be richer – and wanted to feel that way! But extending that line of thought: If there were still high-level challenges for my power, how about high-level challenges for my purse? 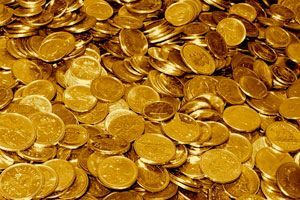 In Skyrim, I was definitely annoyed that I would collect hundreds of thousands of gold coins, but had nothing useful to do with them. Buying the first house is cool, buying the fifth not so much. In any case, it made me think about the various ways you could part a party and their money. If you really want to keep the heroes’ purse empty, just increase the recurring costs. The fact that we are used to those being negligible does not have to restrict us here… in Might & Magic III-V, filling the party’s backpacks with food for fourty days would cost you a few hundred coins, almost barely noticeable, whereas the food stand in the desert oasis in Lords of Xulima will charge about 5,000 gold for five days worth of provisions. Pretty greedy, but it’s not like you have a choice. You mentioned Lords of Xulima in particular, in that game I usually took a few minutes to harvest any edible fruit in the starting area. Just to avoid paying so much gold for the privilege of continuing to play the game (like the good old arcade machines). Especially since there is another gold sink: you can train to get additional skill points and the costs increase every time you do it, almost like Might and Magic. I liked that mechanic much more since it rewarded me for spending my money carefully and prevented me from getting to the point where money doesn´t matter anymore. Yes, that is basically the essence of it. The player should be looking forward to spend his money. Spend it to get some nice things. Let me think… never. (Surprise!) But at a certain point, you have to think about the costs in grander schemes. Take the food costs: They are not only an upkeep cost mechanism. Rather, LoX tried to severely limit resting and increase the appeal of resting in an inn, mainly as a counterpoint to the old Might & Magic games where you could rest anywhere, anytime, and instantly got all HP and SP back. This made inns superfluous and journeys even far away from the home town pretty trivial. Now this may be easier on the player, but it also takes away a lot of excitement in my opinion, and it devalues the town as an adventuring place. I like my overland journeys to be a little more dangerous and unpredictable (see the entry in the Library), so I will probably follow the LoX approach at least partially, although a simple limit on rations that can be carried might suffice.